Q:Can you have your own information or monogram printed on these or only the "sweetie pie"? A:They are only available with "sweetie pie"
Q:I am interested in purchasing only the boxes. Do these come as a standalone product? If not, could you tell me where I could find them? A:No, these boxes do not come in a standalone product. It includes a box, tag, wax sheet, and pre-cut twine. Q:where can you find the pie tins to make pies to fit these boxes?? A:You can find suitably sized pie or tart tins at your local baking supply shop or craft store. The dimensions of this pie box are : 3.5''L x 3.5''W x 1.13''H, so you will want to find a tin smaller than these dimensions to fit inside the pie box. 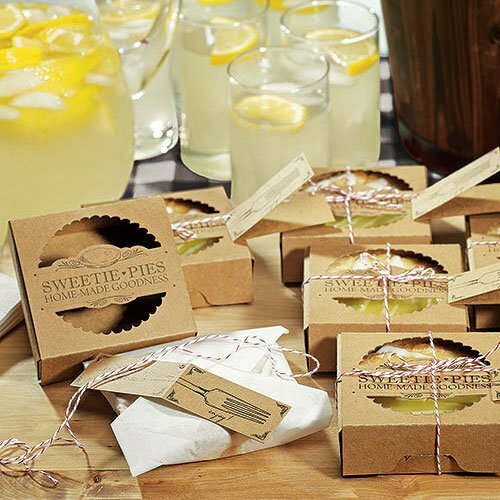 These adorable retro pie packages make the perfect favor for any wedding. This "Sweetie Pies" kit includes everything you could need to beautifully wrap and present 20 miniature pies. Kits include boxes, tags, wax sheets, and pre-cut twine.